"NOBE" Box Frame Hydraulic Presses : American Machine and Hydraulics, Inc. The Nobe presses are box frame hydraulic presses that can be designed for various uses. 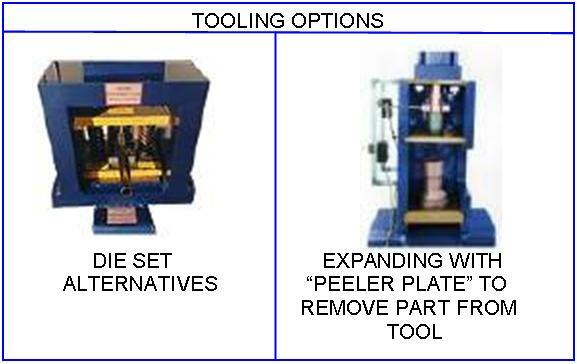 Our customer can select from various box sizes to mount their specific tooling for their application. These unique presses are completely self contained and are portable. The presses are mounted on steel or polyurethane casters. They can be used in a shop or clean room environment. Most models utilize a P.L.C. system to operate the manual or automatic cylinder stroke 24 volt proximity switches are used to acquire exact and precise stroke control. Two palm buttons are also utilized for added operator safety. The speed of the press can also be designed to meet customer requirements. AMH also designs each press to meet the required tonnage for each client. Manual models are also available on request. Please review the various features that are illustrated on our pictured models and call AMH so we can assist you in acquiring the exact Nobe that suits your specific applications.